Weather in June was favourable for the growth and development of hops. Rich precipitations were recorded in Saaz growing area on June, 1st, 12th and 28th. Aggregated rainfall reached in our meteorological station in Destnice 60 mm which corresponds to the long term average. However due to the local storms the total amount of precipitation varied from significantly under average level up to abundant 110 mm. Month average temperature 18°C was by 1°C higher than long-term average. The deviations of the highest day temperatures were from 14,6°C up to 30,6°C and temperature dropped markedly from day to day. The hop plants reached the height of the trellis i.e. 7 meters in the course of June. Due to the warm weather in May and June the growth and development of hops is 14 days ahead. The health state of hops is good. Appearance of pests and diseases is considered so far low. In some areas the hailstorms damaged the hops on the limited area. 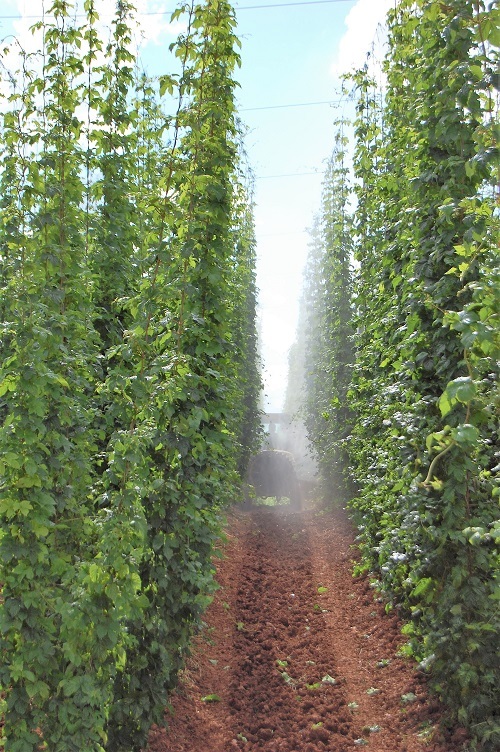 In the most of hop gardens the the second hilling was completed and chemical protection against pests and diseases is applied.